Christian Jankowski, Heavy Weight History (Brotherhood of Arms), 2013, ink-jet print, 55 x 73 1/2". At the heart of Christian Jankowski’s exhibition “Heavy Weight History” was a project encompassing seven black-and-white photographs and a twenty-five-minute-long video realized in the summer of 2013 in Warsaw. Jankowski, in close collaboration with the Centre for Contemporary Art Ujazdowski Castle, selected seven city monuments and organized a group of professional weightlifters to attempt to raise them. In this symbolic way, through a sort of sports competition open to the public, he proposed lifting the burden of the complex and turbulent history whose remnants lurk in every corner of Warsaw. 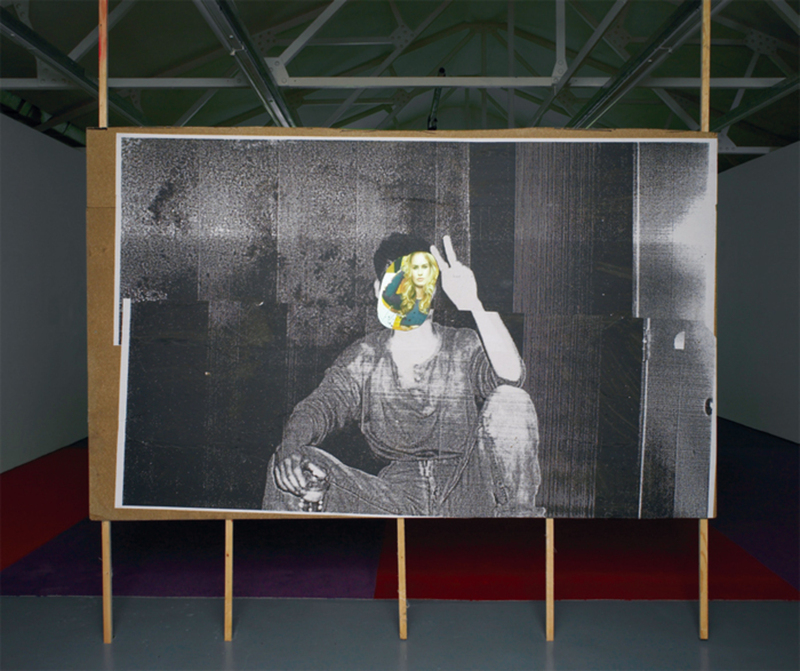 Erik van Lieshout, Stephan, 2013, black-and-white photocopies on particleboard, wood, 10' 6“ x 8' 2 3/8” x 2 3/8". Downstairs was a dense, labyrinthine sculptural installation: a crowded maze of plywood structures, photographs, collages, sketches, wooden cutouts, and photocopies. This “Private View,” as Erik van Lieshout’s show as a whole was called, was seething with anger (I HATE MY FATHER stenciled on a white ground) and Oedipal details (a cutout face of the artist’s mother roughly glued atop the body of a model from a girlie magazine). Recurring throughout was the haunted image of a young man, flashing a peace sign and bearing an air of distant melancholy.